After raising a whopping $81 million in funding from a group of all-star investors, including Salesforce, SAP Ventures, Bessemer Venture Partners, NEA, Andreessen Horowitz and Draper Fisher Jurvetson; cloud storage platform Box.net is setting its sights on the next stage—supporting its developer community. The company is launching the a new platform for developer building off of the Box platform, called the Box Innovation Network (/bin). Additionally, Box is unveiling a $2 million fund (of its own money) to invest in enterprise applications built on the Box platform. Box, which has 8 million users and stores over 300 million documents, is a cloud storage platform for the enterprise that comes with collaboration, social and mobile functionality. Box has evolved into more than just a file storage platform, and has become a full-fledged collaborative application where businesses can actually communicate about document updates, sync files remotely, and even add features from Salesforce, Google Apps, NetSuite, Yammer and others. Currently, company provides storage solutions for 77% of the Fortune 500 with 100,000 businesses using Box’s service (250,000 new users are joining each month). Of course, a central part of this growth, says CEO and co-founder Aaron Levie has been the company’s developer community and ecosystem. Currently, Box has 4,500 API partners and is seeing 200 million API calls per month. In fact, there are four times the number of developers creating applications currently from a year ago, says Levie. Specifically, mobile has seen massive growth with a 30 times increase in the volume of mobile enterprise deployments at the close of Q3 2011 compared to the close of Q3 2010. The company has seen a number of successful API deployments this year at a large-scale at a number of businesses, including Pabst Brewing Company, DOW Chemical, and National Equity Fund. A big part of Box’s next step as a more mature company is bringing developers together into the Box community and help API developers create better applications. “Slow-moving enterprise software giants have produced very little innovation in recent years, and their closed ecosystems have made it all but impossible for outside players to create compelling experiences for customers on legacy systems,” Levie says. The launch of /bin creates a community that supports developers as they work to build enterprise-grade apps off of Box’s platform that will meet business demands and help transform cloud storage. At its core, /bin is structured around its direct partner and member connections. Box is partnering with Appcelerator, VMWare’s Cloud Foundry, Heroku, Rackspace, SnapLogic, and Twilio to offer special services relating to hosting, mobile and more to developers building off the Box platform. The vision for these partners, says Levie, is that they will provide /bin members with the tools and services they will need to build robust applications using the Box APIs. /bin will also offer resources, new features and functionality on the Box platform. In addition to working with platform partners, Box is also investing up to two million dollars in fund money for /bin members chosen to support the growth and development of future enterprise applications built on the Box platform. The funding will go towards equity investments, intellectual property acquisitions, and co-development of enterprise products. 2011 has proven to be a big year for Box. Prior to announcing the major raise a few weeks ago, Box was a $500 million acquisition target (in the last funding round, Box was valued at $600 million). And the company has debuted a number of new product innovations including debuting integrations with Salesforce’s social network for the enterprise Chatter, and a new syncing feature. As for what’s next, Levie tells us that we can expect a major product update in Box’s enterprise edition for businesses soon. We’ll also see a number of exciting partnerships in mobility space and future product development in mobile. Box is also using its new funding towards international expansion and will be opening a third data center in 2012. Of course, part of Box’s future could include a public offering. One of the company’s first investors, DFJ’s managing director Josh Stein told us recently that “Box absolutely should be a public company” and said that an offering is in the company’s future plans. As for how that fits in to today’s news, creating a vibrant developer ecosystem is an important port of Box’s maturation from a startup to a billion dollar (and potentially public) company. 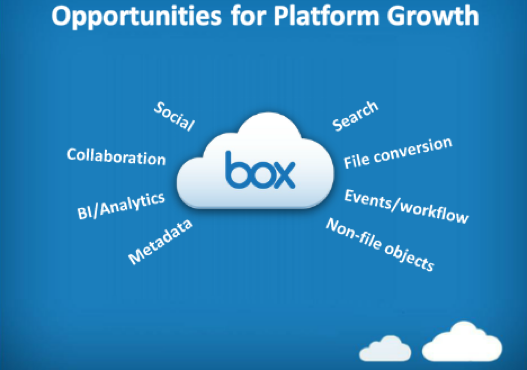 And engaging developers will certainly help Box continue to grow the reach of its cloud storage platform.